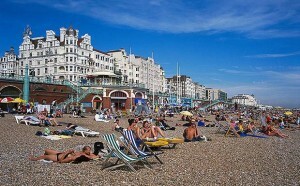 Brighton is an often over looked place to visit for people coming to the United Kingdom. Only about an hour south of London on the British Channel the city offers a good reprieve from the hustle and bustle of the capital. Still though with that said Brighton has the size and an abundant student population that make it fun, liberal, and a great place to spend a few days. A few reasons you should visit Brighton are. Brighton has been called the most liberal city in the United Kingdom. Once you have gotten here you can see why that is as there are several Universities in the vicinity that fill the city with loads of students. The inner city complete with some very inventive shopping streets called the lanes is filled with cool pubs and meeting spots that are filled every night of the week. Along the beach front there are numerous clubs and spots for people to meet up. Brighton’s Middle Street is littered with hostels and there is a cosmopolitan back packer scene that ensures fun for travelers who visit this place. Walking from the main bus station down to the beach takes about 15 minutes and that is how it is for most things in Brighton. You can walk down there in a reasonable amount of time and yet there is still a fair bit going on. One of the most interesting area of the city is along the beach front. Brighton`s famous Brighton pier is the beginning of a great stroll down the beach that has loads of seas side patios, clubs, and restaurants. Culture vultures have enough gigs and theatre performances to keep them stimulated and the Royal Pavilion – an Indian inspired royal residence – to visit. Perhaps this labelling is derived from personal experience, but I found Brighton to be really friendly. The much smaller size of Brighton led to establishing connections around town much easier and people generally not being standoffish. The people that are attracted to Brighton are attracted to the city for this reason and enact a friendly when around other in an infectious way. Also with so many travelers and international students here people are constantly interested in chatting to others learn about other places. Brigton`s pebble beach provides an oasis of sorts for Brightonians to wander down to on a warm day. Perhaps, it’s not the beach culture of Australia but it is a beach none the less with water to dip your toes into. Cool breezes off the ocean also help cool the city down in the summer and give the air a freshness that is certainly lacking in London.